Carpenter Square begins 2017 with “Bakersfield Mist” directed by the versatile Ben Hall. “Bakersfield Mist” by noted playwright and director Stephen Sachs, is based on actual events. A working class woman apparently discovers an unknown and very valuable masterpiece by Jackson Pollock in a thrift shop. Her efforts to get the painting authenticated create quite a controversial saga and receiving a great deal of publicity. “Bakersfield Mist” presents this story in a two-person play about Maude Gutman, the owner of the Pollock painting and Lionel Percy, a composite of many art authenticators viewing the painting. Percy arrives at the Sagebrush Trailer Park in Bakersfield, California to make his assessment at the rather eclectic home of Gutman. 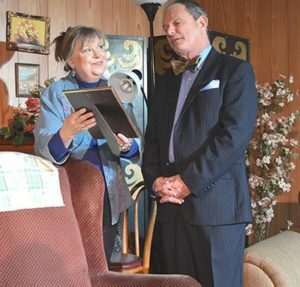 Ben Hall directs Rhonda Clark and Terry Veal in this fascinating comedy-drama. Clark is Maude Gutman, the down to earth, down on her luck, boozy, working class woman who finds the potential masterpiece. Veal is Lionel Percy, the upper-crust, upper-class, fastidious art expert who disdainfully condescends to deliver his expert opinion. The two of them are worlds apart, connected only by Jackson Pollock. An artist reveals his soul in his work. All of the experts Gutman prevails upon to rate the ‘Pollock’ for her find that this particular piece lacks the depth (or soul) of a genuine Jackson Pollock. An actor reveals the soul of each character he plays along with the connection of his soul to the character soul. While there are only two actors in “Bakersfield Mist” there is a third entity—the painting. Ultimately it is up to the audience to determine if the painting has a soul, and if it is Jackson Pollock. Clark and Veal reveal their souls, the souls of Gutman and Percy and they also reflect the soul of Jackson Pollock. In their characterizations it is easy to imagine that Percy appreciates Pollock as a painter, but Pollock would have appreciated Gutman as a person. And the man responsible is director, Ben Hall. Hall is also known as an excellent set designer and builder, and he brings that to fruition in mounting “Bakersfield Mist” for Carpenter Square. It is interesting that he also painted the ‘Pollock’ for the production. With all that ‘soulful’ comedy and drama there has to be a ‘Pollock’ somewhere! Carpenter Square enjoys showcasing a lobby artist for their productions and for “Bakersfield Mist” the featured artist is Kim Harrison. Her medium is alcohol ink and the intensity of ink coupled with the vibrancy of alcohol creates a stunning effect in her impressionistic landscapes. Her work complements Pollock quite well. Playwright Sachs and director Hall deliver with “Bakersfield Mist” a show that is intelligent, enjoyable, and funny as well as soulful. Clark and Veal are cast perfectly. With Hall as director, they display excellent rapport, balance and timing. While there is some language, all patrons should enjoy the production, but there is extra fun in attending with an artist. “Bakersfield Mist” is showing through January 28, 2017. Carpenter Square is located at 800 West Main with easy parking options. Curtain is 8:00 pm and one may enjoy visiting the bar before the show or at intermission. For information or tickets call 405-232-6500 or visit www.carpentersquare.com.